Hundreds of workers at two of Scotland's main airports are being balloted on strike action. Unite said on Friday it will hold an imminent ballot for members at Aberdeen International Airport over a 2019 pay claim, as well as proposals to close the final salary pension scheme. A similar dispute has taken place at Glasgow Airport where Unite is currently balloting its membership. Airport bosses said the pay offer was "fair and reasonable". The Aberdeen ballot is due to open on 5 April and close on 23 April while Glasgow's closes on Monday. Workers at both airports have taken issue with a pay offer which Unite says "represents a real terms pay cut" in light of profits. 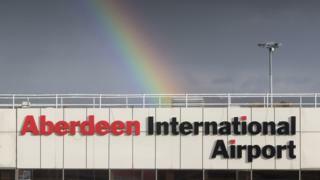 Aberdeen staff have been offered an increase of 1.8% after the terminal's profits increased from £10.7m to £19m after tax between 2016-17. For the same years, Glasgow Airport's profits increased from £50.7m to £74.4m after tax - meanwhile workers have been offered a 1.5% pay rise. Unite has also criticised a proposal to close the pension scheme by AGS Airports Limited group, which owns Aberdeen, Glasgow and Southampton airports. The final salary (defined benefit) scheme provided a set level of pension at retirement - the amount depends on length of service and earnings. All three airports are subject to the pension proposal. The union insisted the move broke an agreement made in 2016 to keep the scheme open to existing members - a claim Aberdeen Airport has called "simply incorrect". A 60-day consultation on closing the scheme in January. Shauna Wright, Unite regional industrial officer in Aberdeen, said: "The derisory pay offer by Aberdeen Airport alongside the proposed closure to the final salary pension scheme is a shameful attack on the workforce. "Aberdeen Airport are asking our members to take a real terms pay cut, while the airport through the hard work of the workforce enjoy a near doubling of their profits over the year." A spokesperson for AGS said the final salary pension scheme was no longer affordable - but they were open to continuing discussions with staff. They continued: "We are disappointed at the decision by the trade unions to hold an industrial ballot following the rejection of our proposed pay offer. Approximately 240 staff will be balloted in Aberdeen while just less than 400 are currently taking part in a ballot in Glasgow. If members vote to strike, staff in Aberdeen are expected to take action during the early May to late July period with an overtime ban scheduled to take place during the same period. Staff in Glasgow are expected to strike from mid-April to mid-October, again with an overtime ban. Ms Wright added: "Unite is balloting our membership on industrial action which, if successful, will take place over the summer period causing widespread disruption. Pat McIlvogue, Unite regional industrial officer in Glasgow, said: "If there is widespread disruption over the Easter and summer months then the public should know now that the company is fully to blame for the situation."